China says it has cracked a terror plot to kidnap athletes, journalists and tourists at August's Beijing Olympics. The security ministry said 35 arrests had been made in recent weeks and explosives seized in the north-western Xinjiang province. It said 10 others were held when police smashed another plot based in Xinjiang back in January to disrupt the Games. 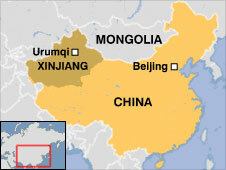 The province is home to many Muslim Uighurs, some of whom want independence in the region they call East Turkestan. Uighur activists have accused the Chinese authorities of fabricating terror plots to crack down on the people of the region and prevent them airing legitimate grievances. Thursday's development was announced by a Ministry of Public Security spokesman at a news conference. Wu Heping was quoted by AFP news agency as saying: "The violent terrorist group plotted to kidnap foreign journalists, tourists and athletes during the Beijing Olympics." Mr Wu said two terror rings had been smashed by the authorities and that militants had planned to launch attacks to disrupt the Olympics from next month. In recent weeks, he said, police had seized nearly 10kg (22lb) of explosives and "jihadist" literature during raids in Xinjiang's capital, Urumqi. He said the militants had sought volunteers to carry out suicide bombings in Urumqi and other Chinese cities. Mr Wu also provided more details on another alleged plot, which the authorities said they had smashed last month. He said those militants had planned to attack hotels and government offices in Beijing, Shanghai and other cities. Poisonings and remote-control bombings were planned and 13 practice explosions had already been carried out, he said. China said last month a plane crew had foiled a hijack attempt of a flight from Xinjiang to Beijing and two passengers had been detained. But some observers question if China is inflating a terror threat to justify a clampdown on dissent ahead of the Olympics. China brands the Xinjiang separatists as terrorists and has claimed more than 260 terror acts have been committed in the province over the past two decades. Many in Xinjiang resent the recent and large-scale influx into the region of Han Chinese settlers, observers say, though there have been few reports of violence. At the 1972 Munich Olympics, Palestinian terrorists kidnapped and killed nine Israeli athletes.